Wandsworth Common is a public common in Wandsworth, in the London Borough of Wandsworth, south London. It is 69.43 hectares (171.6 acres) and is maintained and regulated by Wandsworth Council. It is also a Ward of the London Borough of Wandsworth. The population of the ward at the 2011 Census was 15,247. Nearby, the common has three cricket pitches that play host to cricket in the summer. 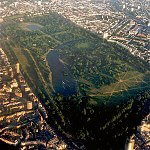 ^ "Common Land in England Wandsworth Common". common-land.com. 2013. Retrieved 27 September 2013. ^ "Wandsworth Ward population 2011". Neighbourhood Statistics. Office for National Statistics. Retrieved 12 October 2016. ^ Lady Allen Adventure Playground. kids.org.uk Retrieved 13 February 2016.